Many thanks to Dr. Sheila Hanlon for permission to repost this blog. Rosa May Billinghurst (1873-1953) was born and raised in Lewisham, London. As a child, she contracted an illness which left her paralyzed from the waist down. Her condition did not, however, deter her from joining the WSPU in 1907 or becoming one of its best known militants. In her youth, Billinghurst and her sister Alice volunteered to work with poor children in the Deptford slums, local workhouse inmates, and prostitutes. Exposure to these injustices may have contributed to her interest in women’s suffrage and inspired her to join the Women’s Liberal Association. When a branch of the WSPU opened in Lewisham, she quickly switched allegiances to this new group, whose political agenda was a better match to her own ideas than the the Liberal platform was. Billinghurst was a dedicated WSPU member. She organised events and meetings, took part in demonstrations, was a regular in processions, and served as secretary of the Greenwich branch. 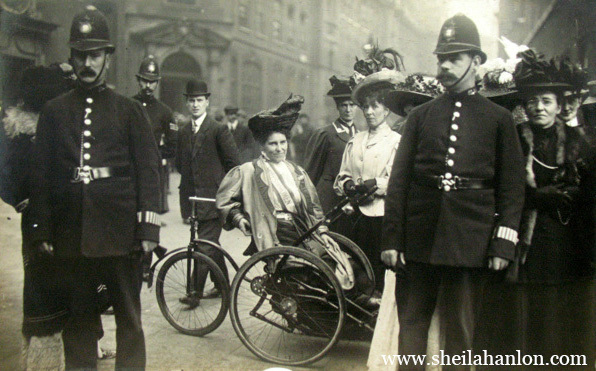 Without the use of her legs, she relied on an invalid tricycle for the mobility she needed to be a full participant in the suffrage action. Her invalid tricycle was, for the time, a high tech wheelchair modeled on a tricycle and propelled by hand controls. In addition to being a regular fixture at peaceful protests, Billinghurst was drawn to militant action and demonstrations. In 1910, she participated in Black Friday, leading the police to try to subdue her by knocking her out of her tricycle, pushing it down a side street, removing the valves from the tyres, and restraining her arms. Never easily deterred, she was back a few days later for the next protest, only this time she came prepared to use her tricycle as a battering ram to get through police lines. Billinghurst received another eight month sentence for her role in the December 1912 attacks on pillar boxes. This time she took part in the hunger strikes. She was released early following brutal force feeding sessions that left her in poor health and with broken teeth. She wrote and protested force feeding once she was released, publishing graphic accounts of her experience in suffrage journals and inspired Keir Hardie and George Lansbury to raise the atrocities of force feeding in parliament. In the years after the suffrage era, Billinghurst remained committed to the cause, joining the Suffragette Fellowship and supporting Christabel Pankhurst’s election campaign forThe Women’s Party in 1918. Rosa May Billinghurst is an inspiring example of a suffragette who overcame disability to become an active participant in the battle for women’s emancipation. Her story reminds us that suffrage was a cause that mattered to women of all types, across class, race, ability, nationality and other divides. Iris Dove, Yours in the Cause: Suffragettes in Lewisham, Greenwhich and Woolwhich,1988. Dr. Sheila Hanlon is a social and cultural historian specialising in the politics and every day experience of women’s cycling. She holds a PhD from York University, Toronto and is a former Research Fellow at The Women’s Library. Thank you for this post. I am a disabled, homeless artist in England. I was hesitating to write about my experiences with the institutions in England today. however this has inspired me to be strong and publish. thank you, Lesley. I hope we get a chance to meet you. come to our event at Blackfriar’s Settlement on 9/7 next month!